The cooler weather is just around the corner. Summer officially ends this weekend. Soon, the travel season will be ending for the year. It is time to start thinking about storing your RV, boats and summer vehicles for the winter months. Some people choose to store these vehicles in their own garages, backyards or driveways for the winter months. However, if there is not enough room for keeping them in a driveway, then it is time to think about parking the vehicles at a self storage facility. Recreational vehicles are very large and do take up a lot of space in a driveway. Storage World offers RV storage at our Jonesboro and Stockbridge facilities. Stop in to find out more about the vehicle parking availability. Just like packing personal belongings for storage units, you need to properly prepare your RV for off-season storage. If you are storing your RV for long-term storage, make sure that you consult your owner’s manual for specific instructions on types of antifreeze, fuel stabilizers and fluids to use. Also, make sure that you have updated the registration, license plates and insurance for the RV before you place it in storage. Some storage facilities will require proof of insurance in order to store these vehicles. 1. Take your RV out for one last drive before it will not be used for the winter. This is a “maintenance run”, where you can listen for any issues that might be going on with your engine and other systems. 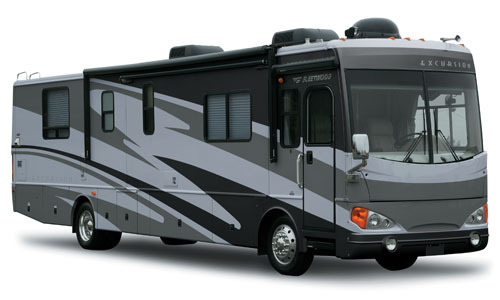 Inspect the outside of the RV to see what repairs need to be made during the off-season. 2. Thoroughly clean the RV inside and out. Wash the outside of the RV and wax it if you have the time. Remove all perishable items from the refrigerators and cabinets. Clean out the refrigerator and leave the door open after the cleaning. Open up all cabinets and leave the doors open for air circulation. Remove the linens and drapery to be cleaned. Vacuum the interior and wipe down any surfaces in the kitchen and bathroom areas. 3. Make any needed repairs to the outside of the RV including the antennae, awnings, windows and doors. 4. Drain and flush the water tanks and water heater. 5. Remove the battery and store in a dry, cool and ventilated area. If you are only storing for short-term, disconnect the battery switches. Connect the batter to a maintenance charger if you are storing the vehicle for a longer time. Once a month, charge the battery to keep it fresh. 6. Change the oil and the oil filter before storage. Check the belts and the transmission, break, steering fluid levels. Fill these up if they are low. Add antifreeze according to the owner’s manual instructions. 7. Fill up the gas tank right before storage and add a fuel stabilizer. Run the engine after adding the stabilizer to make sure that it has run through the system. 8. Store the vehicle on thick plywood off of the ground. This will protect the tires during the winter months. Cover the wheels to protect them from exposed elements if you are storing outdoors. 9. If possible, cover the RV with a canvas tarp to keep it clean and dry during the winter months. Following these preventative tips will help to prevent damage to your RV during the off-season. Properly preparing your RV for storage in the fall will make it much easier to get it ready for the spring travel season.